Published on July 3, 2016 in Uncategorized. 0 Comments Tags: AAANZ, Conference, Film events, Guy Sherwin, Man With Mirror, re-enactment, Super 8. If you make work or think about work that connects with re-enactment, repetition, reiteration and re-performance, or you’re just curious, please come along. 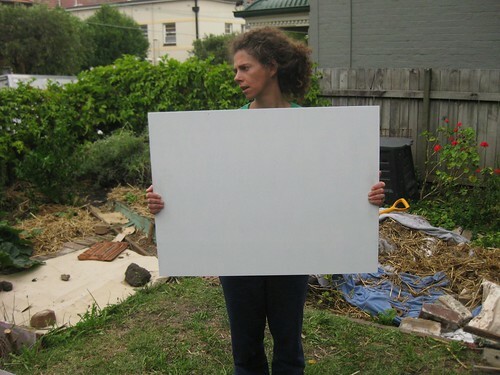 Last November in Brisbane a group of artists, curators and academics spent an afternoon talking re-enactment, repetition and the like as part of an art history conference (more about that in an earlier post on this blog). Several of us will be in Melbourne to listen in at PSi#22, the international performance studies conference and we plan a follow-up chat to discuss our work further, mull over new thoughts and generally reflect on these ideas as we work with them in our practices. We welcome new participants to our conversation. Published on February 10, 2009 in (wo)man with mirror, expanded cinema and Guy Sherwin. 0 Comments Tags: (wo)man with a mirror, expanded cinema, Guy Sherwin, re-enactment. The discussion had two starters. One was the Val conversation re-cap which appears below. Secondly, Lucas discovered the curious picture plane fracture that the mirror introduces in the photos taken in the garden in our last meeting. The mirror appears in each photo of the measuring-up images. It is striking only in one where the mirror is completely surrounded by the rest of the garden. It seems that the mirror reveals a fragment that you know is there but can’t pre-visualise hence its dynamism. General discussion of mirrors and works using mirrors followed. Discussion covered Learning from Seedbed, a work that gave the audience a physical experience of actually being under a version of the platform. – Give the audience the experience of actually re-enacting the work. Film the source footage with a group of people. Present the footage on long looped S8s in the gallery or present the footage on video. have mirrors there for the audience to use to enact the work for themselves and their companions in the gallery. Give them the ability to have visual ‘foldback’ of what they do when they re-enact. – Invite participants to work with a parent or a child to make enactments. Explore if this adds the generational reveal we observed in Guy’s Brisbane performance. – As my mother was here getting ready to take the plane back to New Zealand, we worked with her to actually make a source footage version that I hope to try a performance with. 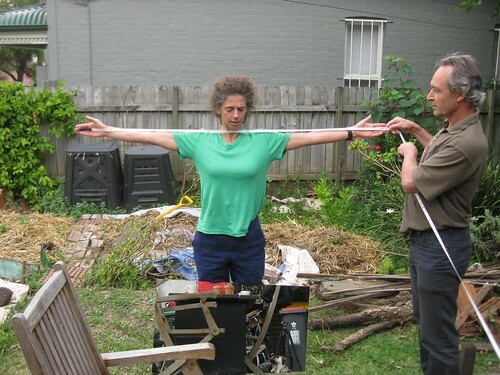 – After working with Val, we realise that we need to work with one pair at a time so that we can teach the work in the same way that Guy so generously passed it on. Louise took the train up from Canberra with her mother Valerie this morning. On the train, discussion about re-enacting Man With a Mirror took place. She described our project as translating a watching experience into a doing experience. She drew in the Degas exhibition she saw in Canberra on Monday. She described Degas’ process of moving from copying the reality of others to depicting his own reality but keeping a mimetic approach. She commented that our process was in a sense the reverse – we start with the evidence of the original work and we try to build up a picture of the work but we’re also looking particularities that crop up because of where, when and who we are and we’re looking to accentuate these. I’m not quite sure how this is the reverse of Degas now, but at the time, it seemed obvious. Val and I also had a discussion about the working method Lucas and I have used with these re-enactments, particularly preparation – that in the past we’ve looked at limitations as a resource, taking the approach of working with what we have in terms of (scarce) time, money and information.Â With Man With a Mirror, we have a great deal of information from Guy. The exhibition means we have some financial resources and therefore time. While we haven’t set out with the intention of doing things differently, it’s my observation that these resources mean we’re increasing our attentiveness to each step in the process which seems to have the effect of making it freer. Published on February 10, 2009 in expanded cinema and Guy Sherwin. 2 Comments Tags: Guy Sherwin, Man With Mirror, re-enactment. However, looking back at these photos (especially the one immediately above this text) I’m now struck by something a bit more interesting to think about. Check out the mirror which is leaning up against my leg. There is the illusion of continuity between the “real” grass and the mirror grass, as if grassy space continues unbroken “through” the plane of the mirror. So when your eye travels up the mirror, the reflection of the chair comes as something of a surprise. I find it confusing and visually compelling, like a mind-bender puzzle. To my eye, the horizontal space of the grass seems to be prised up and over my leg. As if it’s been collaged (or photoshopped) on top of the portion of the photo where I am standing. And then, this photo, with Louise holding the mirror/screen, with the “screen” side towards us, has a completely different visual effect. If you squint your eyes, it is as if the rectangular area of the screen has been sliced out of the picture altogether, giving the impression that you are seeing “through the page” to the blank void on the other side. Chewing over these thoughts, it occurred to me that this Man with Mirror re-enactment project presents more opportunities than we had originally imagined. Mirrors are incredible tools. They’re so ubiquitous in everyday life that I think I usually forget about them, just use them without realling “seeing them” for themselves. When we started with the idea of re-enacting (or re-making) Guy Sherwin’s piece, we watched Guy perform it, studied the video documents, and mirrors were re-enchanted for us. We were able to see mirrors once more, with “fresh eyes”, as the amazing artefacts/tools that they are. 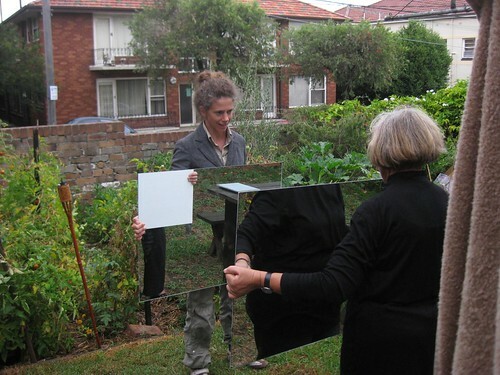 But it wasn’t until we made our own mirrors, and started mucking around with them in the back yard, that we realised how much fun they can be. Now, a sort of transformation of consciousness is happening – I am beginning to see mirrors everywhere. 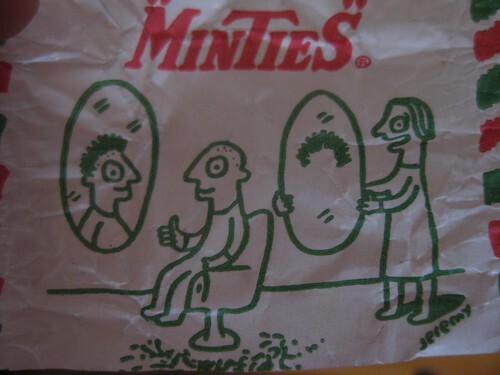 Last night, in a Thai restaurant, I was given a Mintie after dinner, and the above drawing on the wrapper leapt out at me! Published on January 10, 2009 in expanded cinema and Guy Sherwin. 4 Comments Tags: Add new tag, expanded cinema, Guy Sherwin, Man With Mirror. Yesterday we started to prep ourselves to actually shoot the work. We looked very closely at the preview material – Lux preview tape, Lyn’s documentation on YouTube, the rough ‘telecine’ we made up in Brisbane from Guy’s actual film strip literally minutes before he used it for his performance. We also found part of the Brisbane tape of him demonstrating with baby table how to actually do the mirror movements. 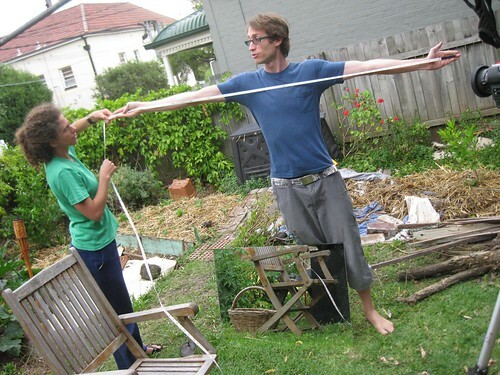 One of these pages documents our notes on the timings of the mirror movements, the other is us working out how to stage it in the garden at Petersham and how we should re-size one of the mirrors so it’s relative to my arm span. 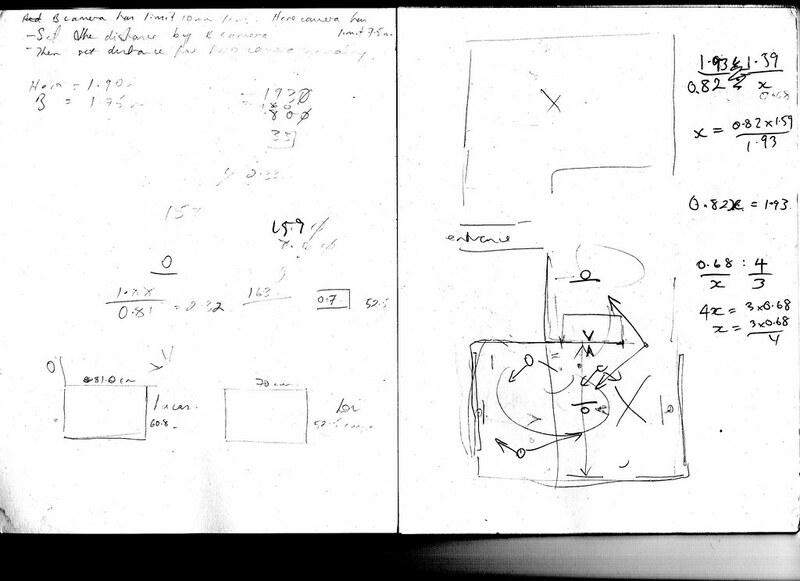 We discussed how we imagine presenting the work – clear at this point that the position of the projectors in presentation needs to be a mapping/index of the position of the cameras in the shoot. This one documents timings from the documentation. 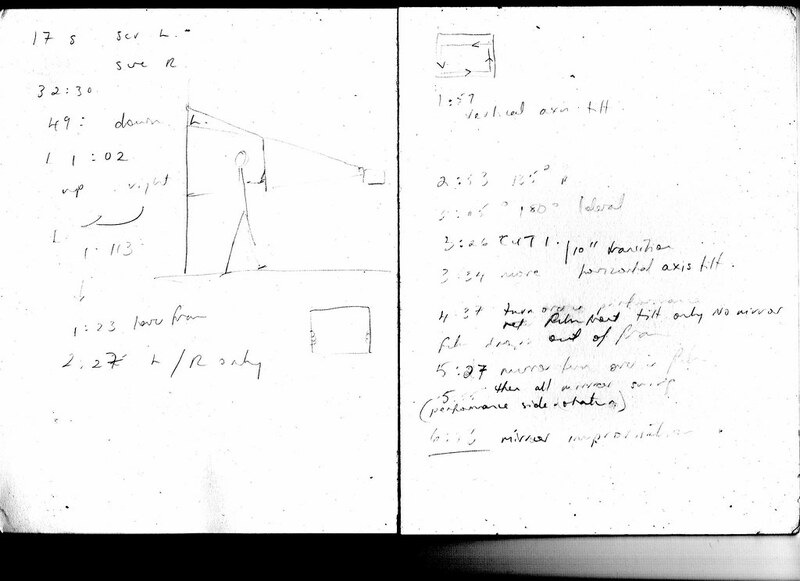 This one documents where to position the shoot in the garden and the correct distances for the cameras and the sizes for the mirrors. Published on January 9, 2009 in expanded cinema and Guy Sherwin. 0 Comments Tags: Guy Sherwin. Louise and I have finally begun the practical work of re-enacting Guy Sherwin’s Man with Mirror (1976-2009). We’ve been looking and thinking about this work for several years now. In August 2008 we spent some time with Guy, when he came to Australia. We saw him performing the piece in Brisbane, and we had a session with him where he “taught” us some of the finer points of the work. This was a great teaching and learning experience, fitting with our philosophy of inter-generational research. A kind of oral history where Expanded Cinema works are passed on from one generation to another. There is something organic (alive) in the essence of the piece that exceeds the archive/document. It is only in enactment/performance that the work can stay alive. The nature of Man with Mirror is that Guy films himself holding a mirror/screen. It is a mirror painted white on the back. He is standing in a park, the camera is on a tripod. He moves the mirror/screen around, up and down, around and around, tilting it, flipping and rotating it. 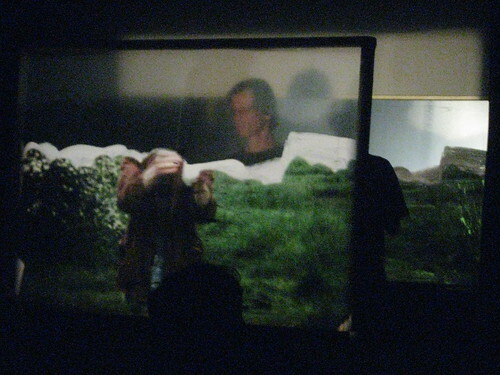 The resulting film is the raw material for the performance. Then, in a darkened room (gallery, theatre, cinema) he projects the film, back onto himself. Standing with the mirror/screen, Guy replicates (or not) the movements he had made on the film. There is a mapping of the past onto the present. It is “conceptually” very tight, as the same man, the same film, the same mirror/screen is used in both the original “performance” (the shooting of the film) and in the present performance (the projecting of the film). The thing about Guy’s Man with Mirror, then, is that in the future, when his physical presence is no longer available to us, the work will no longer exist in live performance. Nobody else can take his 1976 film strip and perform with it. Or rather, they could, and it might be quite interesting, but it wouldn’t be the “same” piece any more. Thus Louise and I have decided the best we can do, in terms of learning about the work, and keeping it alive, is to initiate our own version of Man with Mirror. That is, we plan to re-shoot the film, in our own backyard, using ourselves as the subject, with the intention of then going on and performing it ourselves. Mapping the new film we have made onto ourselves. In 30 years time, as our bodies age further, the work will begin (perhaps?) to take on the qualities that Guy’s version exhibits now. Given that there are 2 of us, we have decided to each make a new version. Thus there will be 2 new Man with Mirrors (in Louise’s case, Woman with Mirror) going into the future. Possibly at some point we can train some more people to do it and the work will multiply and proliferate, or at least ward off extinction for a while. – to set up the cameras in such a way as to (perhaps) capture an aeroplane as it soars overhead during the filming of the piece. It is a characteristic of our neighbourhood that aeroplanes drown out conversation regularly. We are aware that with some of Guy’s work from the 1970s, his subject matter (trains, humans) inevitably become infused with social content (styles of clothing, specific technologies in the background etc) which was never the original intention. However, these later prove to be fascinating impurities in otherwise “pure” conceptual artworks. Published on January 8, 2009 in expanded cinema and Guy Sherwin. 0 Comments Tags: Guy Sherwin. 1. An important aspect of Guy’s method and point of connection for Curham seems to be open curiosity; discovering through doing; at outset don’t know outcome; finding/discovering work/image with camera in hand. Railings for example seems a study of what will happen if? The if is printing the image which has a consistent and patterned vertical into the sound and solves the need to make a visual alteration, a visual ‘what if’ by turning the projector on its side. Man with mirror seems a ‘what if’ on several counts – way for an ‘experimental film maker’ to bring own body into performance, to perform; curiosity about translation of film screen (something about it being both subject and object ie it’s the topic of the film in one sense but it’s also the material centre, the device); curiosity about space, expansion of space by the way the mirror behaves and by the index of the screen in the location of the original film. It is the tool that callibrates the original space with the space where the performance takes place, that allows the original to be ‘mapped’ onto the performance site. 2. The time shifting element is interesting – connection to Anneke’s comment about altering the usual chronology of event and documentation – I think this is what she’s trying to get at somehow, how you can expand and contract time by making something in one place and then re-making it another, almost too simple a thought but it does have some kind of potential concertina (ph. sp.) aspect (ie ability to expand and condense) which is what we’re doing with the re-enactment. a. curiosity Guy employs creates a quite ego-less performance mode. curiosity in this sense is quite synonymous with don’t know the outcome. b. discussion about guy’s other work and his work with Lyn, discussion about vowels and consonents as a different kind of work in that it is composed rather than found – in the sense that some of the other works explore a purely material property and so you could call them found. d. discussion about how formal film artworks ie material film ie Sherwin’s material films are very open texts, can have multiple readings because the implied focus of the maker is quite restricted which means the audience has very free reign which becomes more and more free as time passes and the texts resonant in more and more unexpected ways. For me this is the essence of archival material, the way it can be read and interpreted can carry so much more alongside the original intention and purpose.